Send in a Testimonial to us! "They burn hot, easy to store, can't say enough great things about these." Thank you for this response, I've recently changed my seals and have had a significant difference thank you for the advice. Regarding your product; I've purchased a sleeve of bio bricks, and a few other brands. Nothing compares to your product! Honestly I am amazed. I used 8 bricks to heat my 1960 sq. foot house for over a 13 hour period. Other products burnt out after a few hours. I will be purchasing bio bricks in bulk rather than cords of wood from now on. I wanted to let you know the superiority of your product and how very satisfied I am. "By using BioBricks, I also contribute to reducing our dependence on oil." "Thank you for supplying me with BioBricks. By using BioBricks, I have saved nearly $1,500 on heating oil this year. In addition, I’m pleased that BioBricks produce less creosote and ash, that they burn longer and hotter than cordwood, and they store in a compact space. By using BioBricks, I also contribute to reducing our dependence on oil. My only complaint is that supply does not meet demand at the height of the heating season. Sometimes I hesitate to recommend BioBricks for fear that a higher demand might limit my ability to get BioBricks when I need them. Thanks again for a wonderful product." "I find BioBricks to be superior to cordwood." "Thank you so much for creating and producing a great product. With high expectations I tried BioBricks for the first time last night, and was extremely pleased! I find BioBricks to be superior to cordwood in many ways. Beyond the environmental, storage and practical advantages (which are huge), BioBricks provide a better, more consistent and predictable burn compared to cordwood. I have much better control over my stove's temperature now, and it stays consistent for hours on end. With cordwood there always seemed to be a heat curve: it would burn increasingly hotter until the wood broke down into coals, and then start cooling. To maintain a more constant temperature, I needed to adjust the airflow periodically throughout the burn time, which is impossible while sleeping! With BioBricks this is unnecessary. Once I establish a well-burning fire and stock the stove, I can close the damper and adjust the airflow ONCE for a consistent temperature that lasts overnight and into the morning. The BioBricks just keep giving off a constant glowing, moderate-flaming heat until they crumble into ash. I admit I was skeptical when I first heard about BioBricks. I did a lot of reading before deciding to buy 2 pallets, and my main concern was the risk of overfiring, something my stove's manufacturer warned about when using biomass fuels. In my case this concern turns out to be unfounded (I use a thermometer to measure stovetop and flue temperatures). The risk of overfiring is greater with cordwood in my stove, depending on the size, type and condition of the wood, and how I stock and adjust the stove. BioBricks provide a uniformity of size, density and moisture that makes them totally predictable, and they eliminate the need for adjusting the stove in ways that increase the risk of overfiring. Please feel free to use my words in a testimonial (you should have a testimonials section on your website!). Best of luck to you and thanks again for a great product!" "I am madly in love with your product." "Not for nothing, but I have to tell you that I am madly in love with your product. Heating oil prices being what they are, many of us up here in the Maine back country could not prepay this year. So. Bio bricks from Damariscotta Hardware. They ignite. They heat. They are wonderful. As you advertise, no bugs, no splitting, no nothing except hauling into one's garage. (which, given the 1900 lbs in one pallet was not a small task for an old lady, I might add) Ash production is about half what it is with my purchased firewood. Also "made in the US" is not to be discounted among many of us. Long may all of you wave!" "Not having the dirt, dust, bark, insects and spiders associated with my wood pile of the past is a pleasure!" "This past week I had the pleasure to meet with the partners and visit the factory of the Original BioBrick company, a Connecticut based company. Currently selling in the Northeast, from New Jersey to Maine, this sustainable energy (product) company is growing leaps and bounds. As always, my disclaimer is that I have no financial interest in this company or product, have received no incentive for this article, and have purchased my test "bricks" at retail price. So what is a BioBrick? Partners Steven Lanata and Jason Blakeslee describe this all natural product as "the cord wood alternative". The BioBrick is 100% wood, manufactured from recycled sawdust acquired from such sources as mills, and hardwood flooring manufacturers. The BioBrick uses no glues or artificial binders, being formed into a brick by the molding process and natural fibers and oils from the wood itself. But what makes this product so good to use? First I would say the ease of use. Since starting to use BioBricks in my wood stove and fireplace, I have not had to split and pile any wood, which has been very good for my back. Packaged into a 38 lb wrap (recycled plastic), each wrap contains 20 bricks, it is easy to carry into the house, and easier to store, as one 4' X 4' X 3' pallet equals a cord of wood. Ease of use and packaging leads to another benefit to the homeowner, cleanliness, not having the dirt, dust, bark, insects and spiders associated with my wood pile of the past is actually a pleasure. No longer do I have a trail of debrise following me to my wood stove or fireplace. 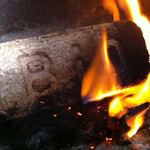 Cleanliness is also evident from the small amount of ash that the BioBrick produces, and Partners Steven and Jason have shared with me that commercial users of the BioBrick (restaurants that use wood burning ovens) have also noticed less creosote from using this product. They also like the consistent burn the BioBrick offers, allowing them to use only the bricks needed to arrive at the temperature required for their ovens, taking the guess work out of the equation of using wood. I have noticed the same consistency of heat within my wood stove, and have particularly have enjoyed the fact that I can load the wood stove when I go to bed and find enough hot coals available in the morning to easily restart my stove. Steve and Jason told me that this is due to the density and uniformity of the brick, important to maintaining that consistency of burn. Besides wood stoves and fireplaces (I highly recommend) other uses for the Original BioBrick are camping (many State Parks no longer allow the gathering of wood on site), RVs (again ease of carrying, use, and cleanliness), and cooking (wood burning brick ovens). Like any great product, copycat companies and products are springing up. These other copycat products come in different sizes, grades and quality, so don't be fooled, look for the package that says The Original BioBricks, The Cord word Alternative. It is printed right on the recycled plastic wrap along with instructions for use. Because of this consistency, density, and manufacturing quality, The Original BioBricks are endorsed by wood stove manufacturers around the country. One sad note about this sustainable product is the lack of interest and support from the political community. Although Partners Steven Lanata and Jason Blakeslee have made a substantial investment in bringing us this recycled product (saving countless trees in doing so), there has been no excitement generated by local and state politicians. Maybe its not high tech enough, glamorous enough, or maybe they can't see a way to personally benefit from this "Green Technology" I don't know, all I do know is that in my opinion, it is the only product that a homeowner should use in their wood stoves and fireplaces, I know from this moment on, it will be the only one in mine." "All I am using this winter to heat my house!" I am putting in a Hydro to heat convertor in from Marc Caluwe." "The BioBricks are the best thing that has happened to us!" a ton of money on heating this year. With everyone concerned about our ecology these days we are sure your product will be a Godsend to everyone. Thank you again." "Love, love LOVE bio bricks!" "My husband and I use your product all winter. He is a lineman, I am a photographer. One afternoon, as we started our fire, I got in and took a picture. My friends all said to send you the picture, and proof of your customer love, and in case you just wanted to post it on the testimonial section of your site. Enjoy, and thanks again for such an amazing product!!!" ©2011 BioPellet LLC. All rights reserved. BioBrick manufacturers, the company behind the Original BioBricks.